Last fall, a number of companies announced they would be finally be releasing dongleless Xbox One wireless gaming headsets. Prior to this announcement, wireless gaming headsets for Microsoft’s console required a base station of some sort, as well as numerous cables to connect to your Xbox One for audio. With the announcement, OEMs are now allowed to tap into the Xbox Wireless ecosystem and provide true wireless connections to the Xbox One. 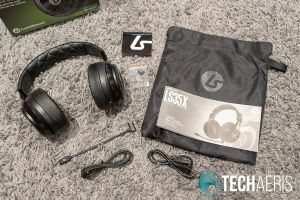 Our LucidSound LS35X review takes a look at one of the first Xbox Wireless gaming headsets for the Xbox One. 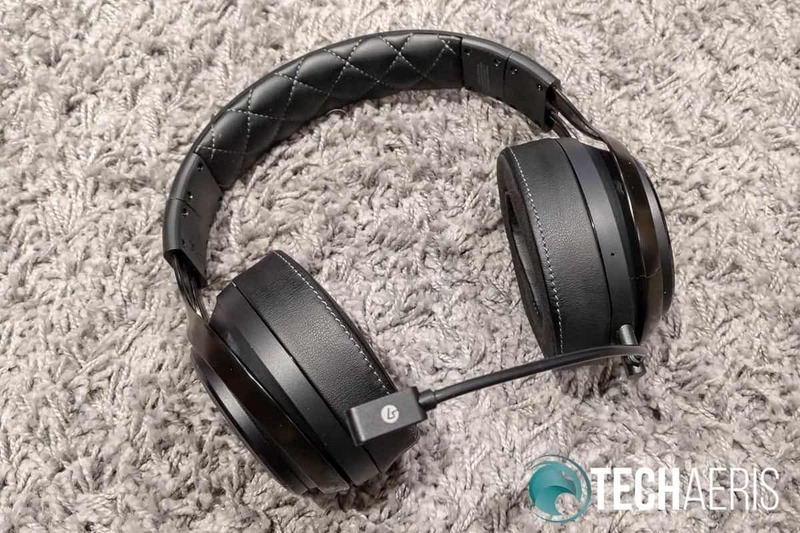 Read on to find out why it easily earns a Top Pick and is my new favourite Xbox One headset. 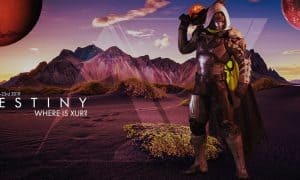 Gaming headsets can be flashy, that’s for sure. 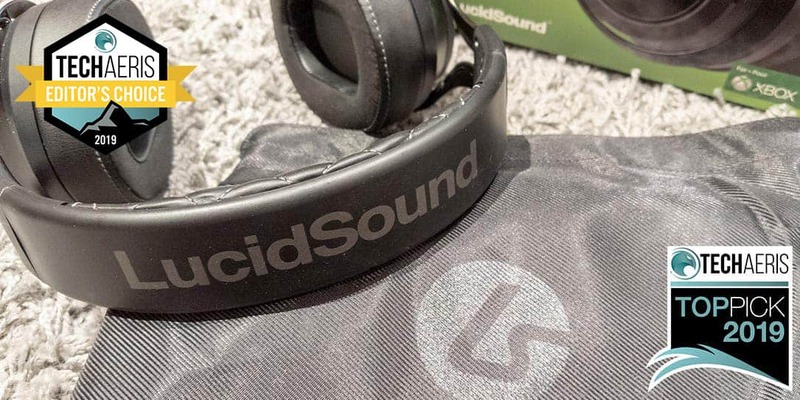 LucidSound has opted for a sleeker black look without any flashy colours on the LS35X Xbox Wireless Gaming Headset. Starting at the top, the headband has a hard plastic top with the LucidSound wordmark printed in silver/gray across the top. The underside of the headband has a stitched faux-leather finish with just enough foam padding for added comfort while gaming. The headband slides back and forth on a headband rail to offer optimal fit for various head sizes. Nice stitched faux leather padding underneath the headband. 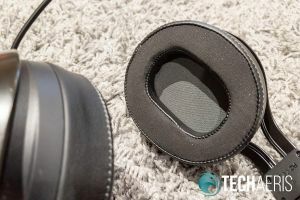 The headband attaches to the earcups by way of a swivel connector. On the inside of this connector is an L or R to indicate earcup placement. Just under this connector, the metal earcup frame wraps around the outer earcups with a floating-type design. The outer face of the earcups has a circular textured finish with the LucidSound logo in a light gray circle. 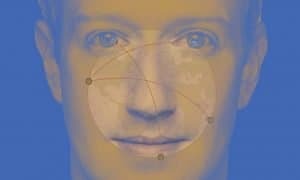 These outer faces also double as function buttons and the outer ring around these faces also rotates. We’ll discuss their functionality in the next section. On the underside of the left earcup, you’ll find (going from back to front) an LED light, the power button, Micro-USB port, 3.5mm input jack, the microphone port, and a tiny hole which is an onboard microphone. On the underside of the right earcup, you’ll find a single Xbox Wireless button towards the back. The buttons and ports on the underside of the earcups. As for the earpads themselves, the outer and inner edges are finished with the same faux-leather as the underside of the headband. The surface which actually rests against your head is fabricated from a plush, breathable cloth liner. Underneath this liner is a layer of cooling gel on top of the main memory foam layer. As I wear glasses, comfort is hard to come by with some headphones. In the case of the LS35X, however, I had no issues with comfort wearing any of three different pairs of glasses. 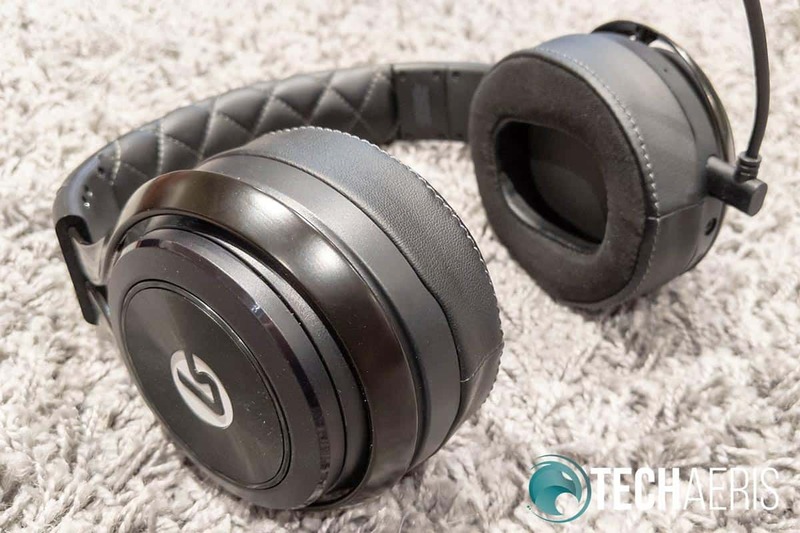 In addition, the earpads are detachable and you can purchase replacement ones for US$19.99 from the LucidSound website. 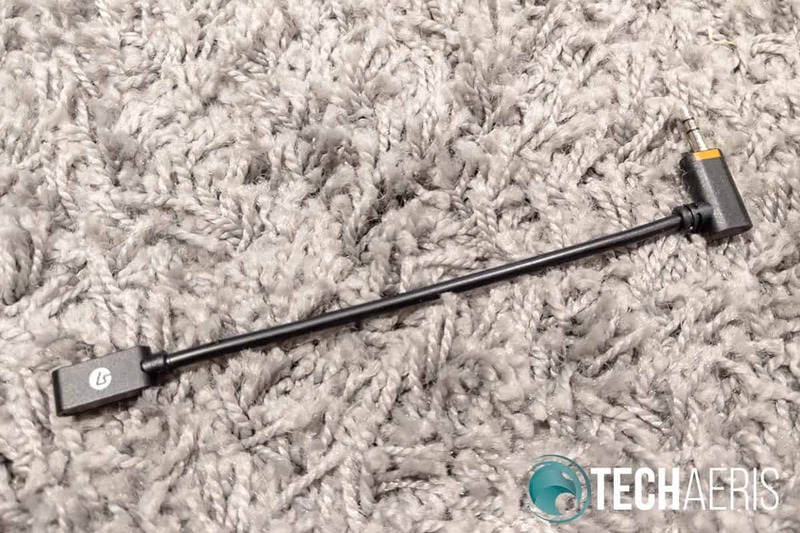 The detachable boom microphone is just over 6 1/4-inches in length. One end houses the 3.5mm jack which connects the microphone to the headset. 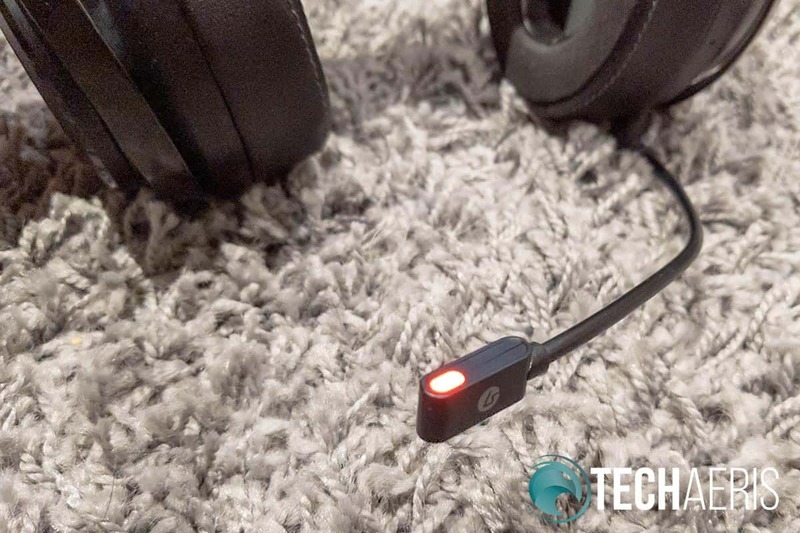 The other end is where you’ll find a flat, rectangular microphone with holes on the inside, the LucidSound logo on the outside and an LED light on the upper edge. When the microphone is muted, this LED light turns red. 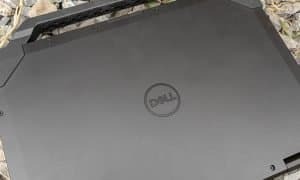 When it is on, you can easily see it on in your peripheral vision, which is great but at the same time the glare is distracting and a tad annoying. Whenever I had the mic muted, I ended up pushing the microphone down until I couldn’t see the light any more. The main arm of the microphone is plastic coated and flexible, allowing for perfect placement for your voice chats. In addition to the usual charging cables and 3.5mm audio cable for use in wired mode, the LS35X also comes with a cloth carrying pouch. The outside is a nylon material while the inside is lined with a softer felt. There is also a pocket on the inside for storing your extra cables and whatnot. 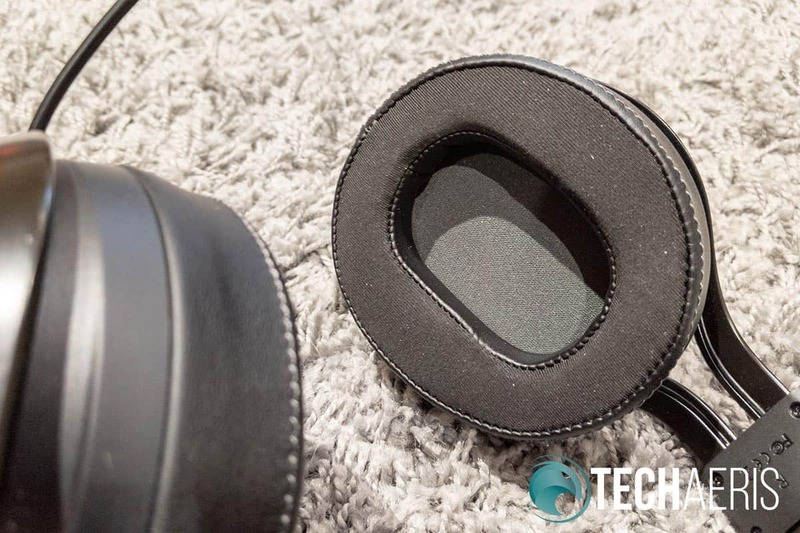 It won’t offer much in the way of protection from bumps, it will keep your gaming headset protected from dust and scratches while carrying it in a backpack or other bag. 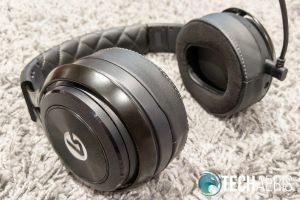 Overall, the LucidSound LS35X has a very sleek and elegant design as far as gaming headsets are concerned. With a solid construction, metal frame, and light weight, it’s definitely comfortable to wear and pretty sturdy. If you’ve just picked up the LucidSound LS35X, you’ll want to make sure you update the firmware. You can do this via your PC and instructions are listed over on the LucidSound support site. 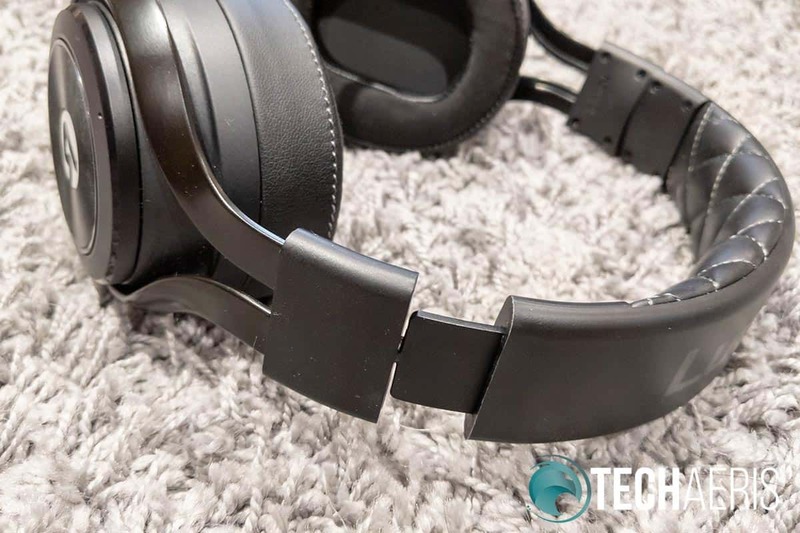 While it doesn’t affect sound quality, it does offer a few other updates including audio cutting fixes, improved mic monitoring, and improved battery life reporting. Once you’ve charged the LS35X gaming headset fully, power it on by pressing the power button. You don’t have to hold it down to turn it on but you do have to hold it down for a couple of seconds to turn it off. This is definitely a thoughtful feature as they pretty much instantly turn on and are ready to go yet won’t accidentally turn off if the power button is brushed while on. Once on, press and hold the Xbox Wireless button on the right earcup and then press and hold the Xbox Wireless button on your Xbox One. The LED on the headset and your Xbox should both start “breathing” and once they pair up, the lights will go solid and you should get a message on your Xbox One that you’ve connected a headset. 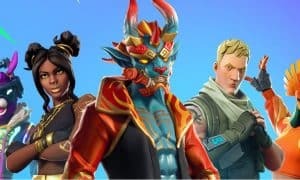 Once paired initially, turning them on while your Xbox One is on will automatically re-connect them and you’ll be good to go. The LS35X works with Windows 10 PCs as well, but only if they have built-in Xbox Wireless or you have an Xbox Wireless USB dongle. You can also use them with the included 3.5mm audio cable on mobile devices, your PC, or your Xbox One through the controller. This is a great fallback in case your battery dies while in a gaming session and you need a quick fix for sound. In the Design section, we mentioned that the outer face of both earcups act as buttons. The button on the left earcup mutes your game when pressed and unmutes it when pressed again. The wheel on the left earcup acts as volume control. In the case of the right earcup, pressing the button will mute/unmute the mic while pressing and holding it for about three seconds toggles mic monitoring. Finally, the wheel on the right earcup adjusts your game/chat balance. One thing that is missing here is that there is no indication as to when you are at 50/50 for game/mic balance. It’s not the end of the world but a little click or an audio cue would have been a nice feature. 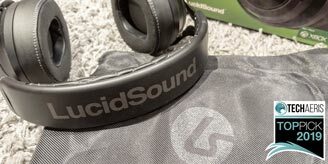 The LucidSound LS35X features “custom tuned 50mm speakers with state-of-the-art neodymium magnets provide deep bass and clear highs,” at least according to LucidSound’s website. I must say, I was not disappointed at all with the out of the box performance and was even more pleased with the sound quality once I enabled Windows Sonic on the Xbox One. I usually have it on anyways but turned it off for my initial tests with the LS35X. The inside of the earpads are nice and soft and contain cooling gel as well as memory foam layers. 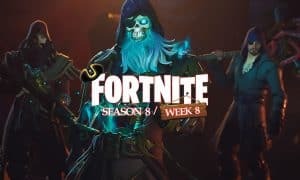 On that note, on the gaming side, everything from Forza Horizon 4 to Anthem to Apex Legends sounded fantastic. The virtual surround sound via Windows Sonic was pretty bang on and balance between lows, mids, and highs was fantastic with just the right amount of bass. Switching over to movies, it’s really easy to lose yourself in them with the sound quality on the LS35X. Finally, music on both the Xbox One and my smartphone through Spotify was just as great with the perfect amount of bass, mid, and high balance. The bass is warm and full, and not punchy, which is what I prefer. Whether it be gaming, movies, or music, the LucidSound LS35X sound fantastic. Of course, while gaming, voice chat communication is important — especially in team or squad based games. During our testing, the microphone quality of the LS35X is great with other party members indicating I was coming through “loud and clear.” The option to enable/disable mic monitoring is fantastic as well as it gives you the choice as to which you prefer. Personally, I prefer mic monitoring and it worked as expected with the LS35X. The LS35X actually has two microphones. 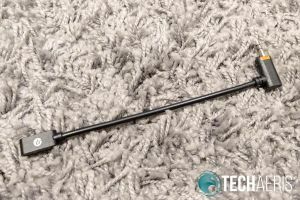 The detachable boom mic and, as mentioned previously, a smaller pinhole microphone for mobile use. Interestingly enough, with the boom mic detached, the smaller mic will still pick up your audio on the Xbox One so you’ll need to remember to mute the microphone as well with the boom mic detached. On that note, the onboard microphone was pretty clear and crisp as well, according to other parties while testing. As with most non-boom headset microphones, I did have to speak a bit louder when not using the boom mic. When muted, the LED on the microphone shines red. 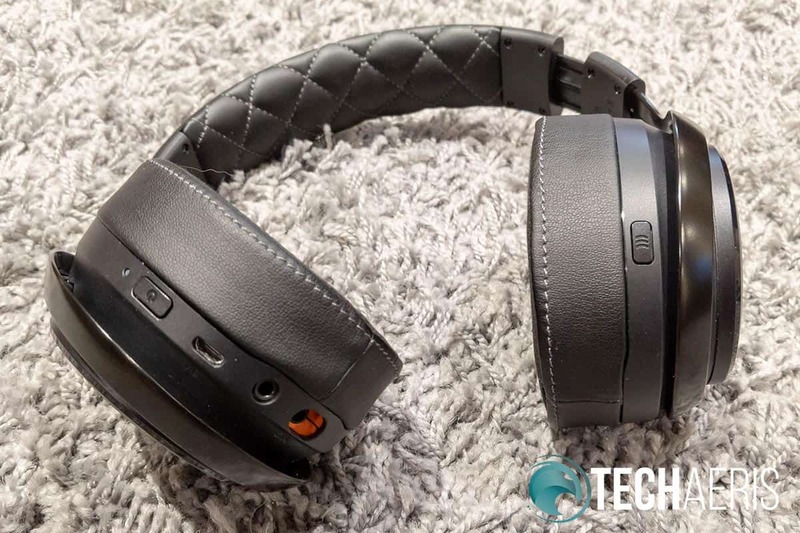 LucidSound claims up to 15 hours of battery life with the LS35X. While I didn’t track actual battery life hours, I game about 2-3 hours each night. That being said, I’ve found that I’m charging the LS35X about once a week which indicates between 14-16 hours of battery life when used at about 50-60% volume. When depleted, charging takes a couple hours. However, you can still use them while charging if you run out of battery mid-game and have a nearby outlet or extension cord you can use. While quality and sound are great, buying decisions usually boil down to the cost and if it’s worth it. 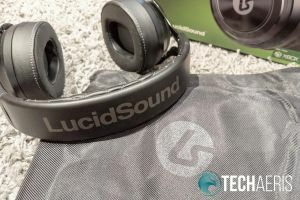 The LucidSound LS35X have an MSRP of US$179.99 which, while on the expensive side, isn’t the most expensive but also far from the most affordable. 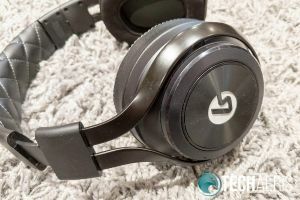 With the solid build quality, fantastic sound, and decent battery life, however, the LucidSound LS35X are well worth the price if you are a frequent gamer. On that note, you can save yourself $5 by picking them up on Amazon. There are plenty of console headphone options out there but few offer up the Xbox Wireless one-button sync functionality that the LucidSound LS35X do. With an attractive, slick design, fantastic sound, and great battery life, the LS35X should definitely be on your consideration list if you’re looking for a wireless Xbox One gaming headset. It’s because of those points that the LucidSound LS35X has easily earned a Top Pick of 2019 Award here at Techaeris and have taken their spot as my (current) favourite Xbox One gaming headset. *We were sent a sample of the LucidSound LS35X Gaming Headset for Xbox One for the purposes of this review. 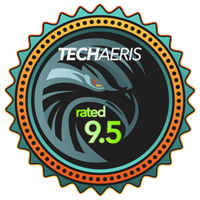 In some of our articles and especially in our reviews, you will find Amazon or other affiliate links. 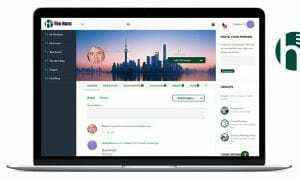 Running a website does take money, along with time. 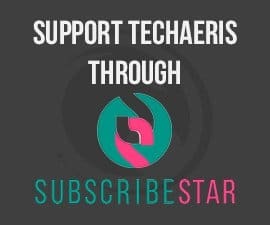 Any purchases you make through these links often result in a small amount being earned for the site and/or our writers.